The British Council followed up its “Poms Will Whinge” campaign in Australia with a viral campaign showing the lengths people were prepared to go to meet and work with UK professionals through the Realise Your Dream competition. 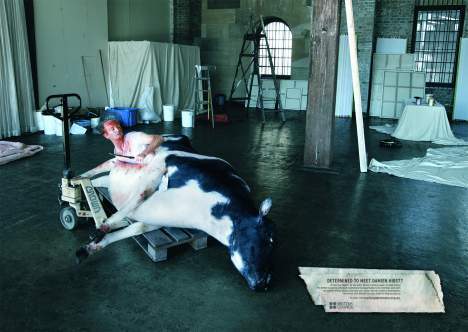 ‘Cow’, shows a man cutting himself out of a dead cow in the middle of a design studio in a bid to meet Damien Hirst. Hirst is an English artist known for his installations featuring dead animals (including a cow). ‘Fashion’ shows a girl posing as a naked mannequin in a fashion designer’s studio, hoping to meet English fashion designer Stella McCartney. The Realise Your Dreams campaign was developed at M&C Saatchi, Sydney, by creative director Ben Welsh, copywriter Dave Shirlaw, art director Michael Jones, agency producer Jennifer Cuthbert (print production) and Rod James (TV production), with photographer Adrian Cook. Interestingly Charles Saatchi was Hirst’s sponsor between 1991 and 2003. Director for the TV ad was Michael Jones, with post production done at Frame Set & Match. The Realise Your Dream is a scholarship program open to anyone between 21-28 years of age working or studying in creative fields such as design, architecture, advertising, music, film, fashion, animation, multimedia, performing arts and computer games. The British Council uses its powerful UK network to find suitable mentors and money-can’t-buy work experience for the six winners. The prize also covers return airfares to the UK and $8,000 toward relevant course fees, accommodation and living expenses for each of the six winners.